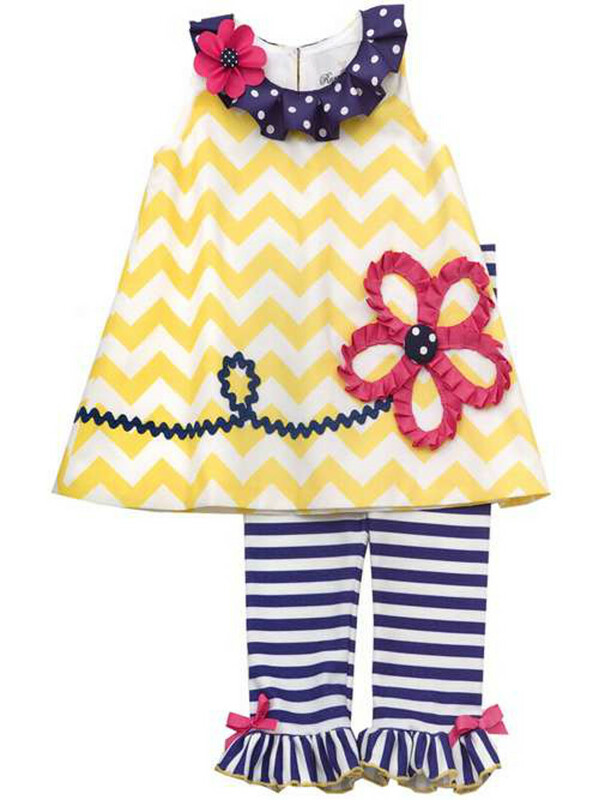 A mixture of chevron and polka dots make this adorable outfit even cuter! Yellow and white chevron top decorated with a soutache flower applique. Navy and white stripe leggings Complete this spring look! TOP: 95% COTTON/ 5% SPANDEX PANT: 58% COTTON/ 38% POLYESTER / 4% SPANDEX EXCLUSIVE OF DECORATION MACHINE WASH COLD WITH LIKE COLORS, DO NOT BLEACH, DELICATE CYCLE, LINE DRY, COOL IRON ON REVERSE SIDE.